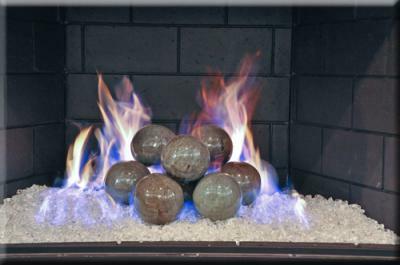 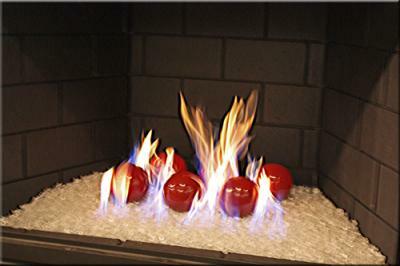 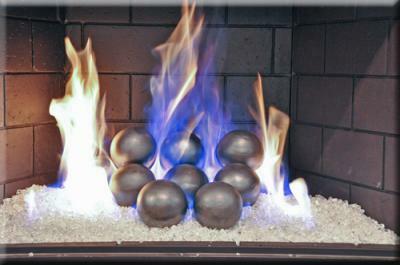 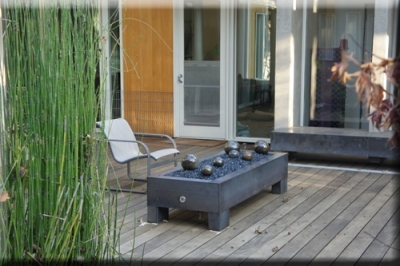 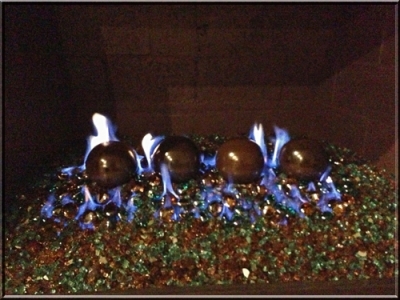 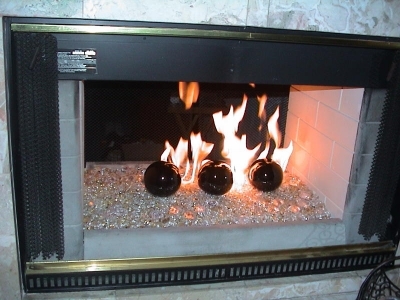 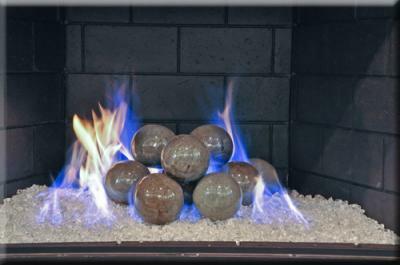 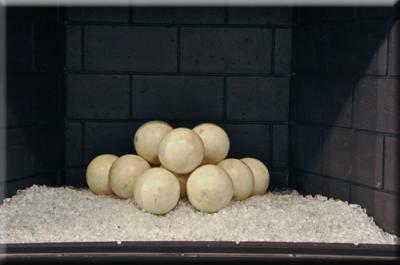 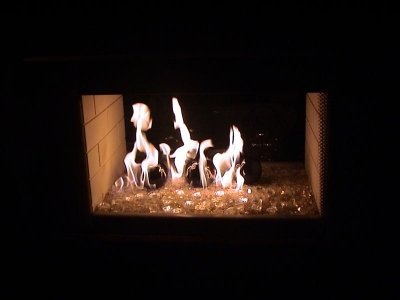 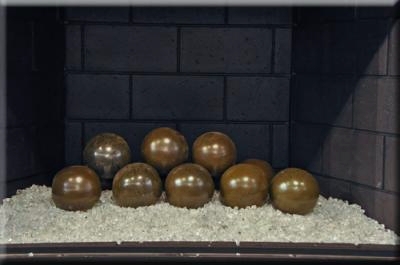 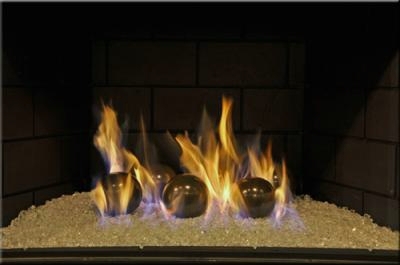 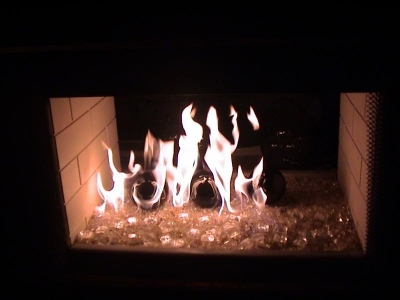 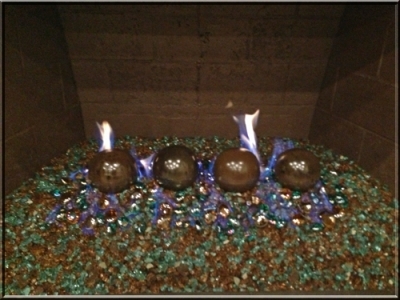 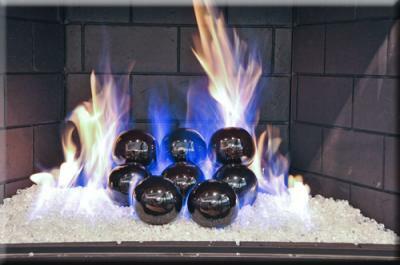 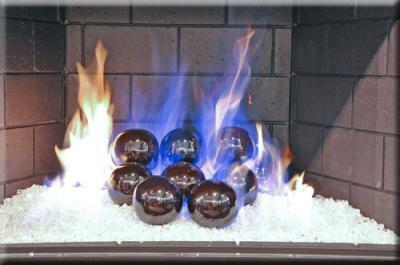 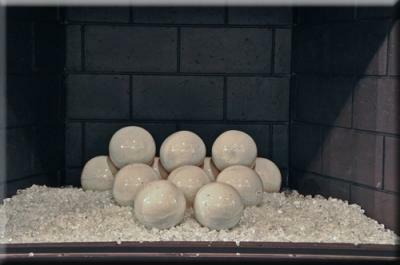 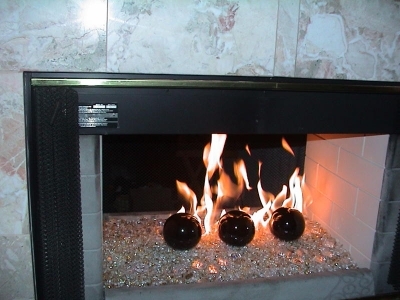 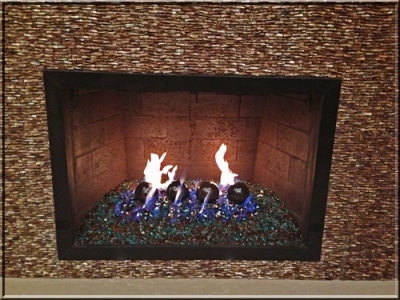 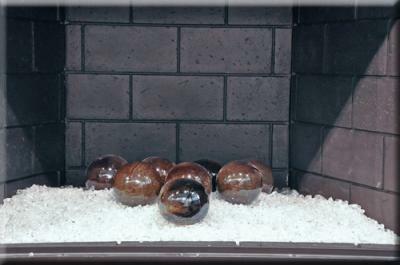 These pictures come to us from our client George who got 4 of our 4" inch Moss fireballs for his fireplace. 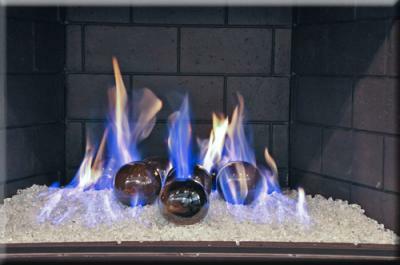 His complete order included Bronze Rust Copper & Azurlirte fireglass, Metallic Warm Brown fireplace paint, Teal ED Diamonds and a Steel Powder Coated Fireplace Surround. 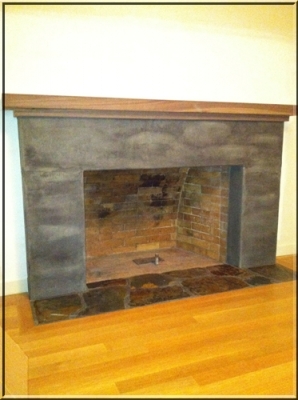 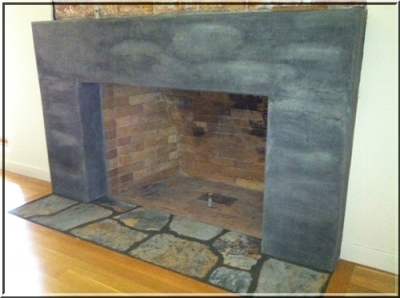 Our client Paula, disposed of her old dirty logs, cleaned out her fireplace but wasn't sure what exactly she wanted? 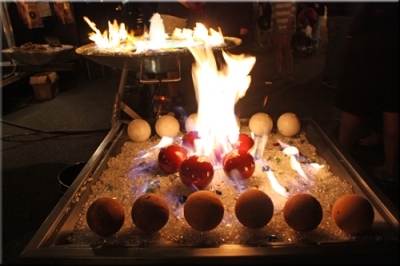 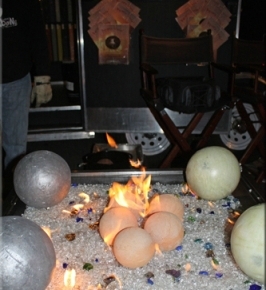 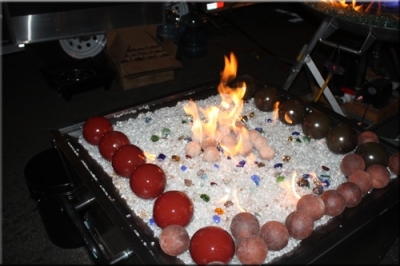 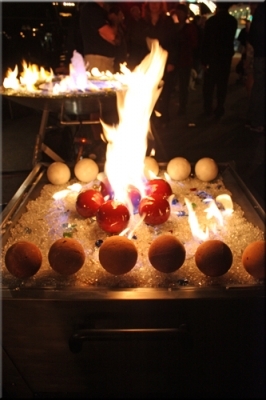 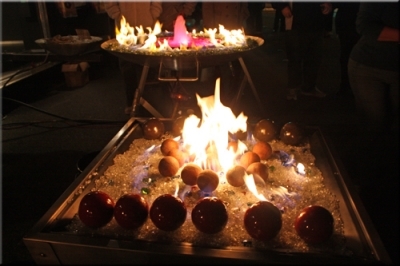 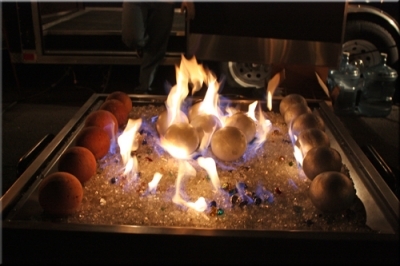 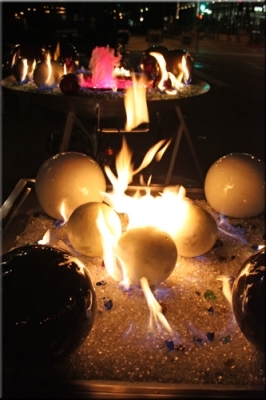 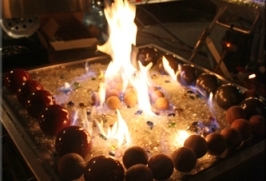 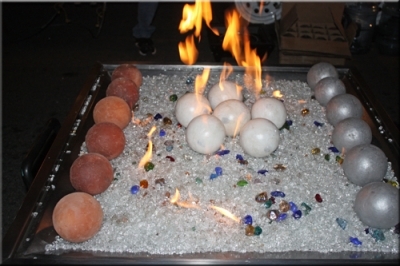 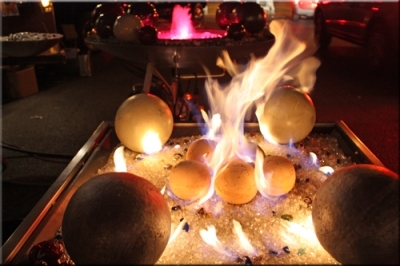 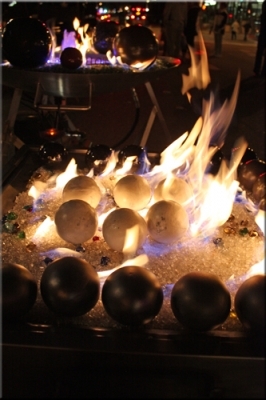 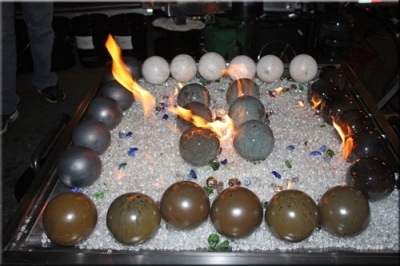 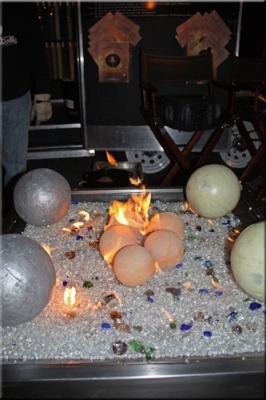 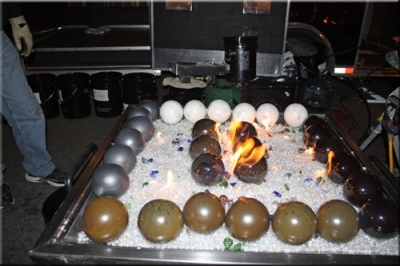 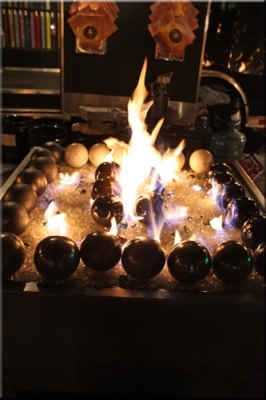 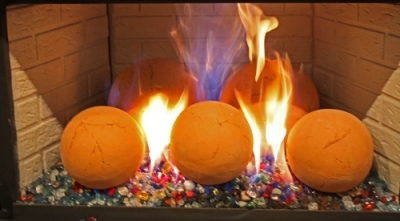 She ultimately took a unique approach with her 4" terracotta fire balls, and had us paint them different colors with our high-heat paint. 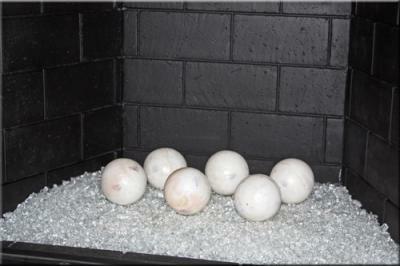 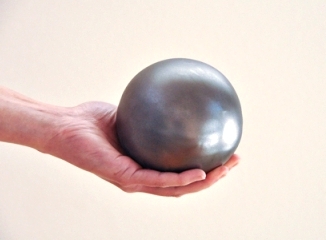 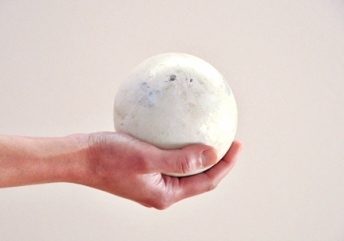 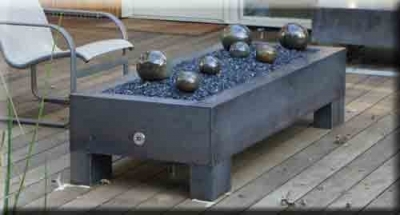 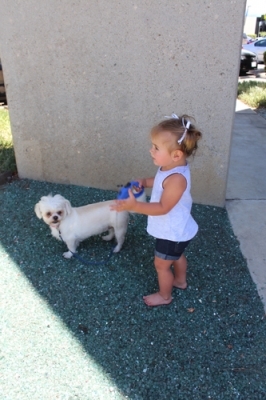 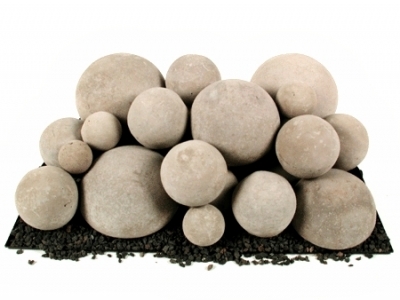 She also mixed some of our solid concrete balls in the set. 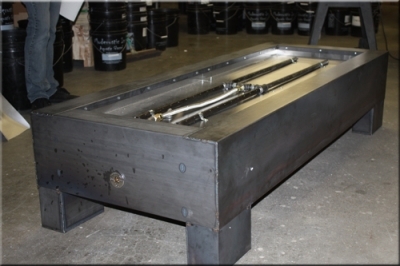 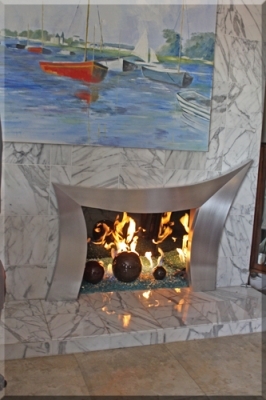 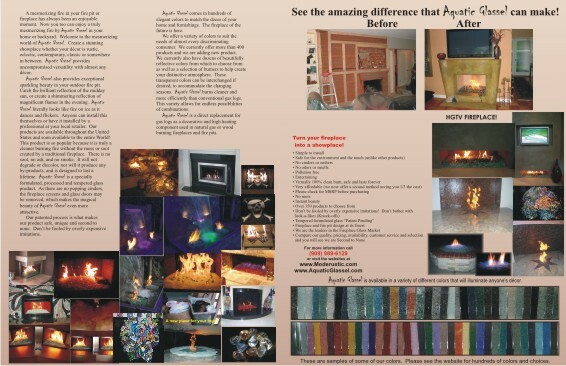 Lastly she replaced her old burner with a double 30" inch indoor fireplace burner. 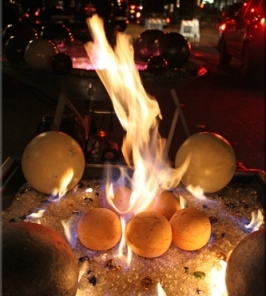 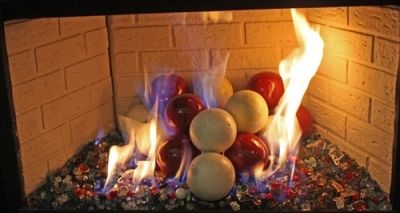 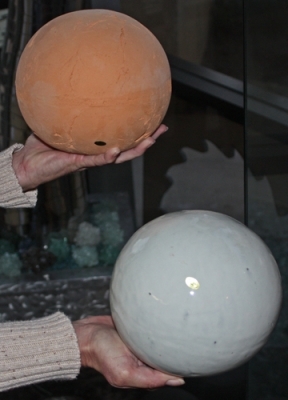 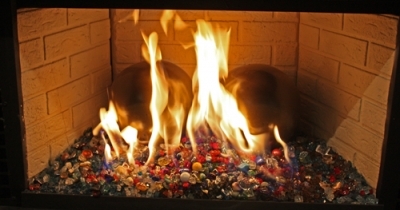 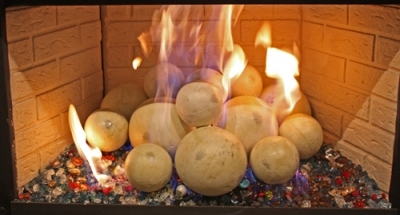 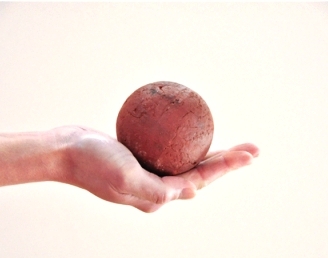 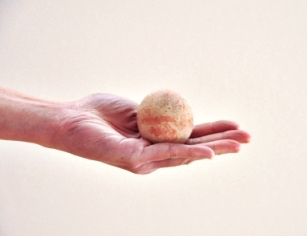 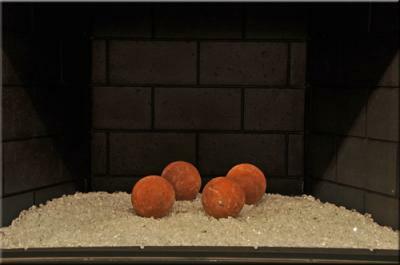 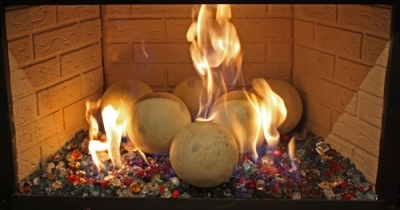 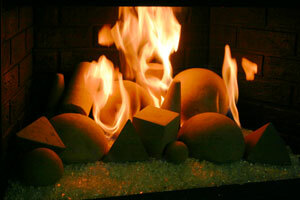 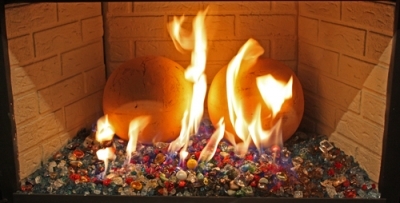 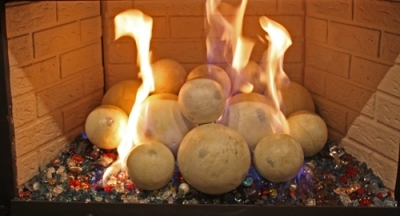 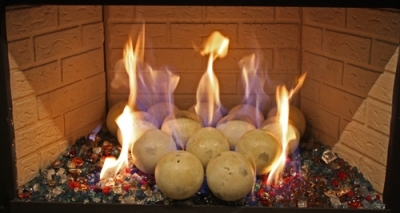 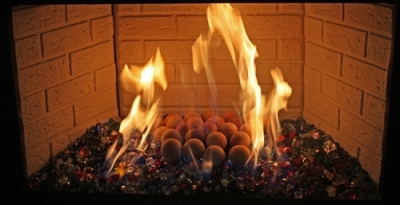 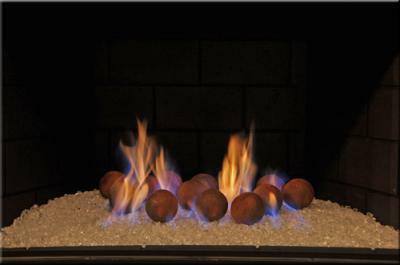 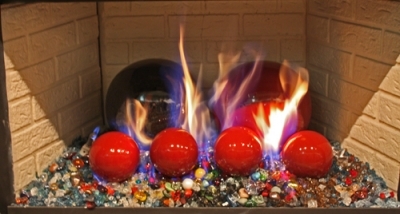 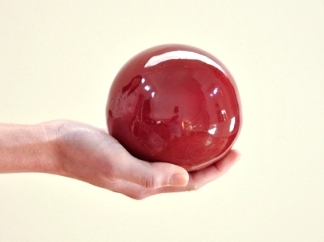 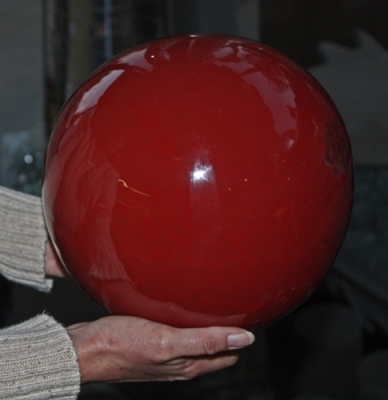 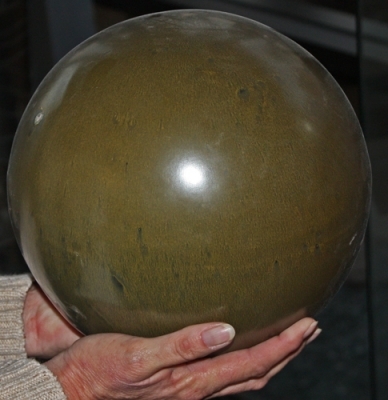 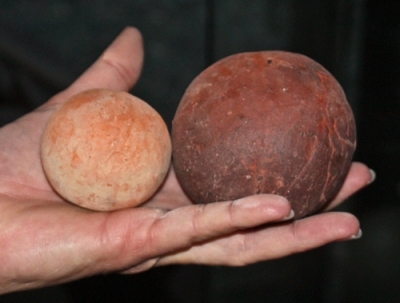 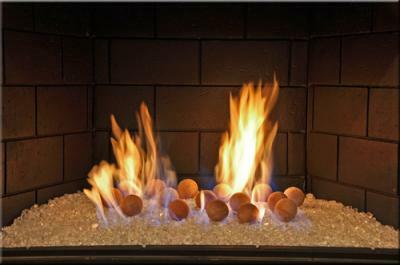 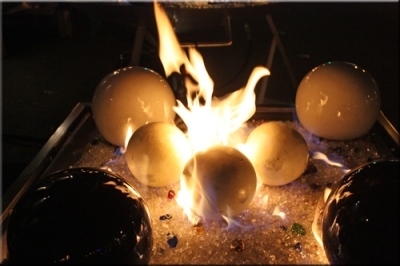 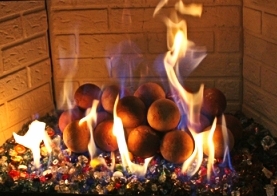 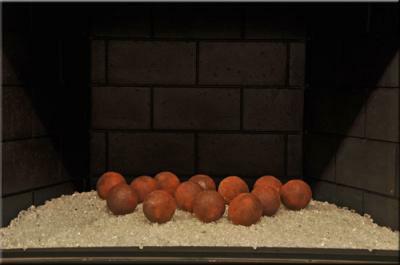 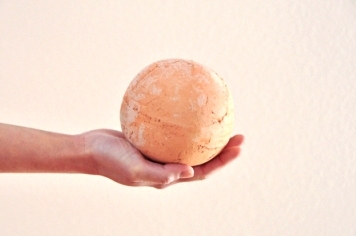 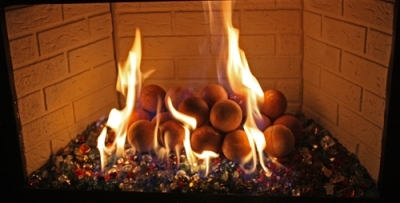 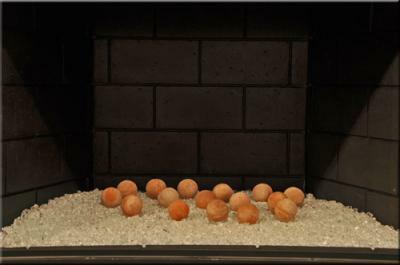 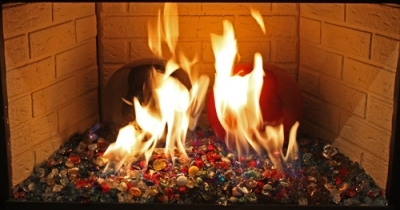 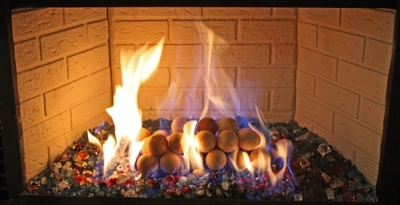 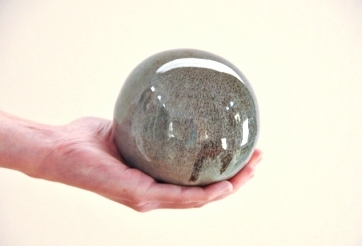 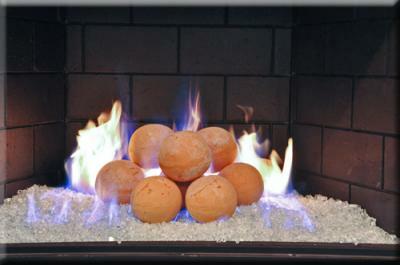 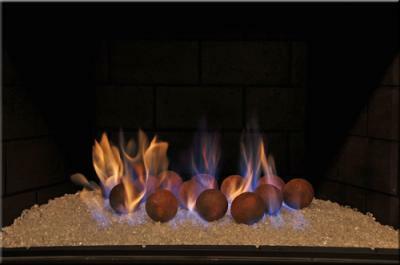 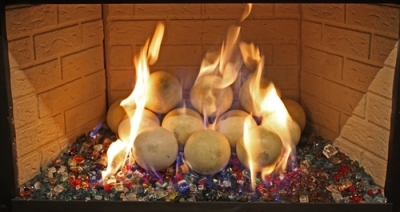 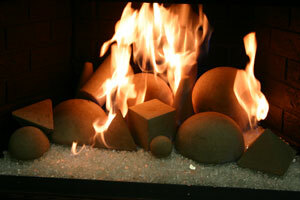 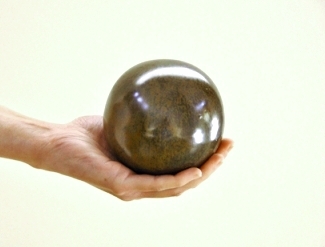 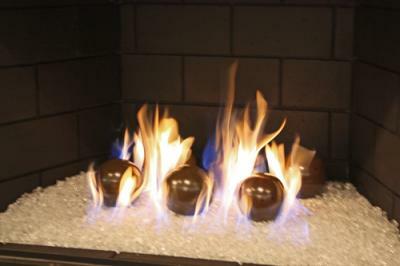 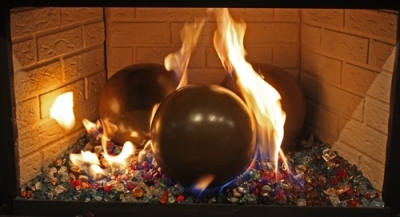 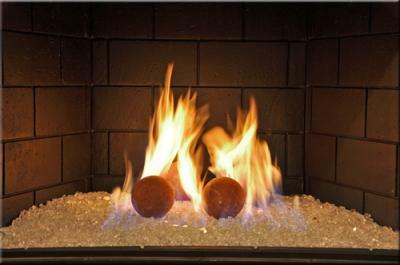 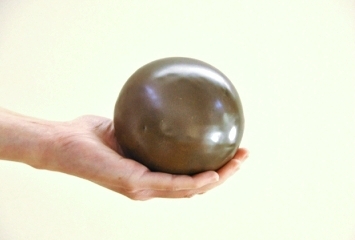 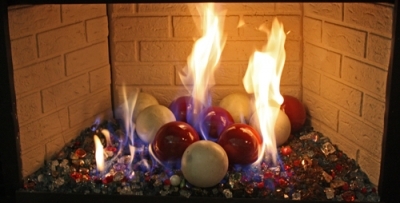 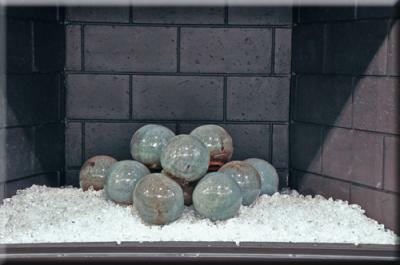 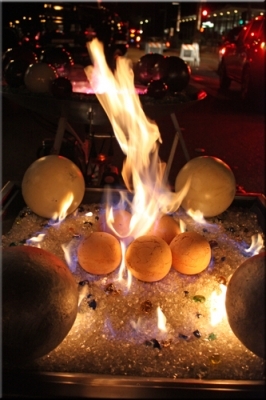 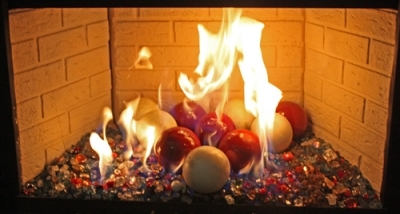 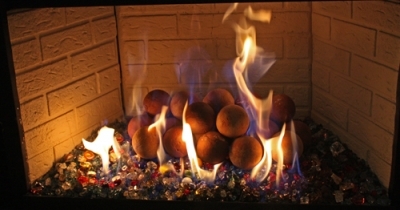 CRACKING: Hollow TerraCotta FireBalls are not to exceed temperatures of 600 degrees. 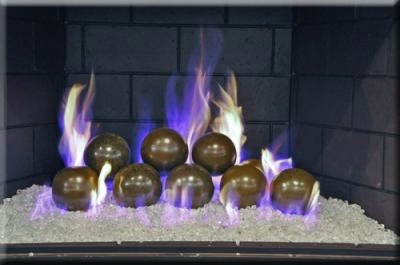 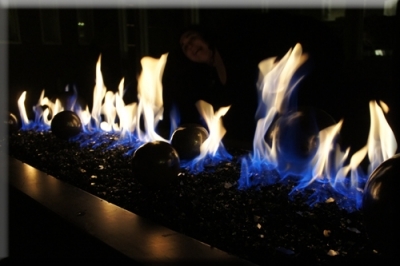 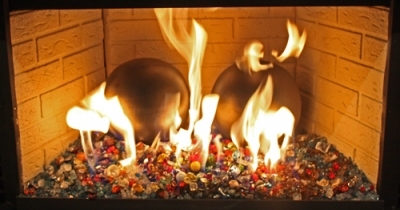 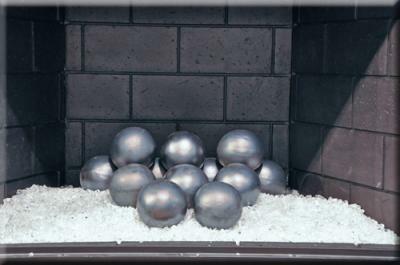 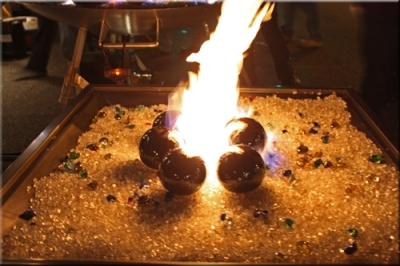 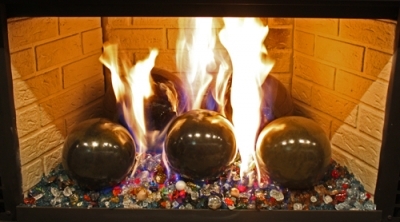 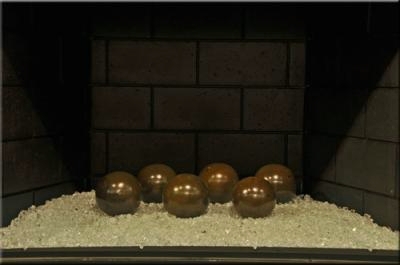 If placed directly on the fire, under excessive heat, over a long period of time, the FireBalls will crack. 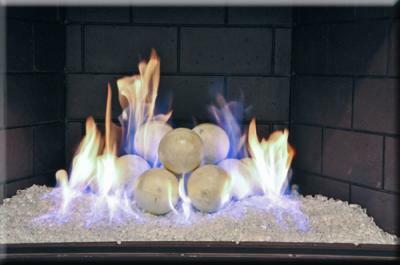 We would advise the following guidelines: If directly in the flames, run a low to medium flame, and remove when planning to run on high flame. 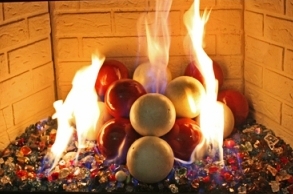 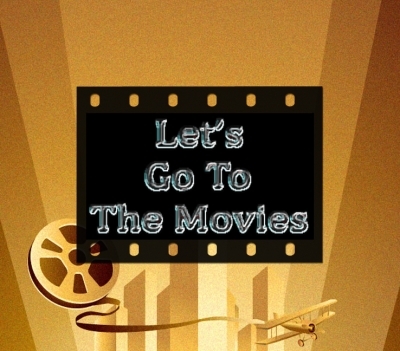 Place the FireBalls behind the flames, and or in front of the flames. 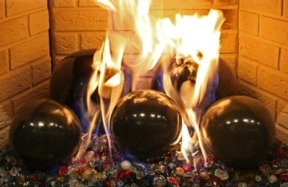 If FireBalls are in the flame, Do-Not place the opening of the hollow fireball down, allowing the flame to enter the hollow FireBall. 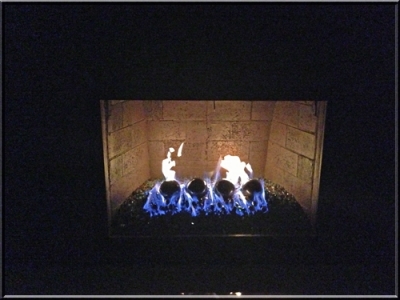 Have the opening facing away from the flame (ideally facing the back of the fireplace). 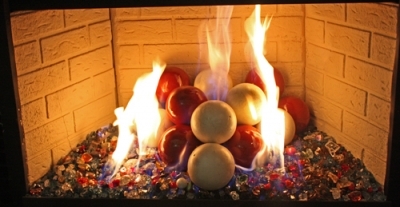 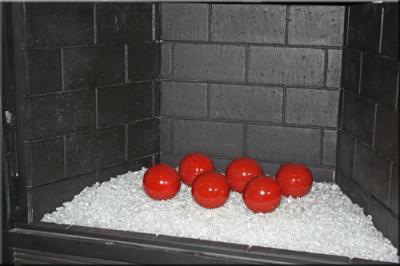 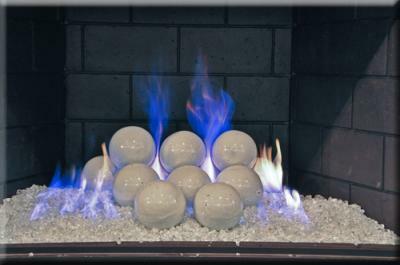 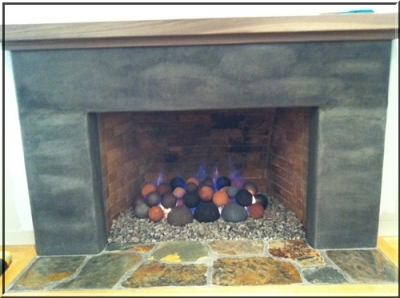 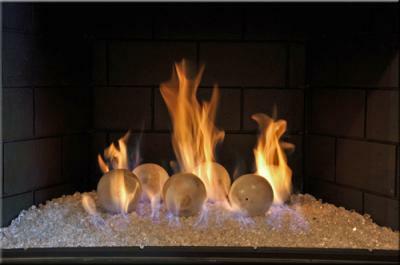 Porcelain coated, TerraCotta FireBalls (hallow): These are handmade 2-piece construction, and then porcelain coated. 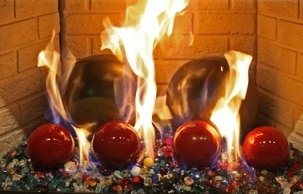 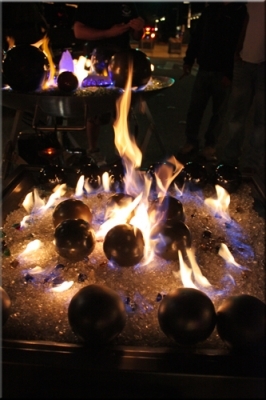 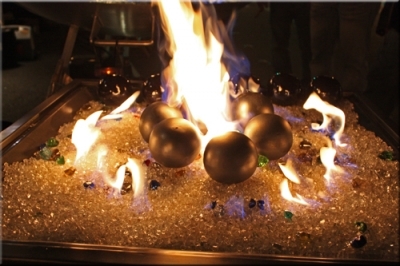 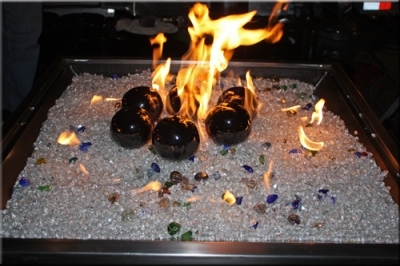 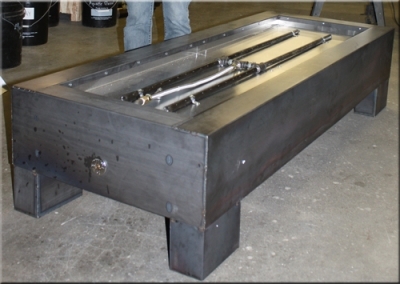 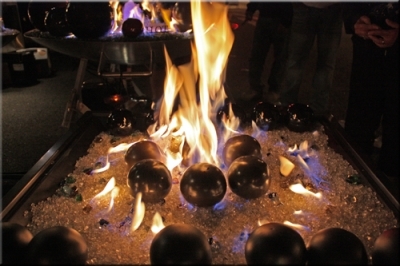 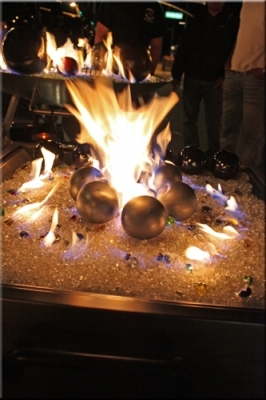 Because of the nature and construction of these FireBalls and the actual material, there is no guarantee to the finished look. 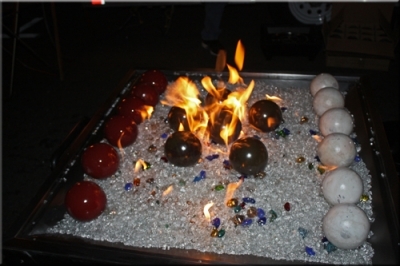 The porcelain is applied and fired up to 2200 degrees. 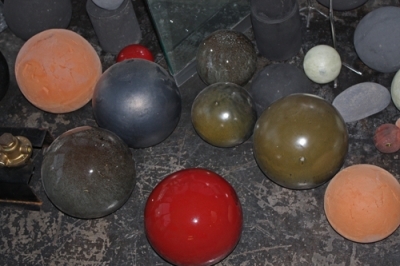 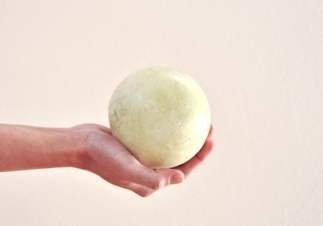 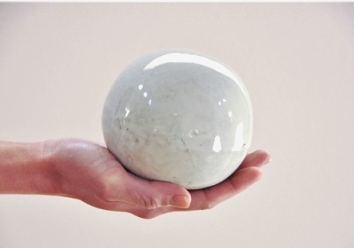 The rate and adhesion is different with every batch of balls manufactured. 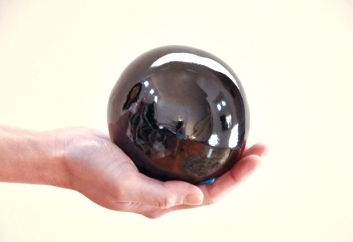 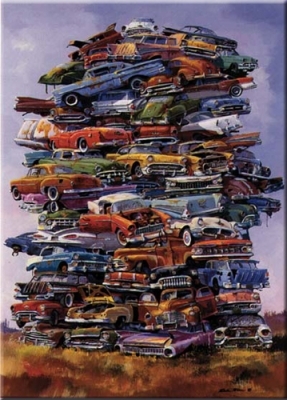 Some may be shinier the others and or smoother. 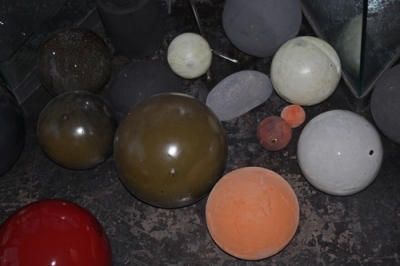 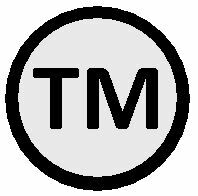 Some may be and can have a rougher texture than the previous batch. 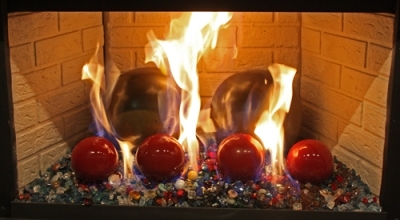 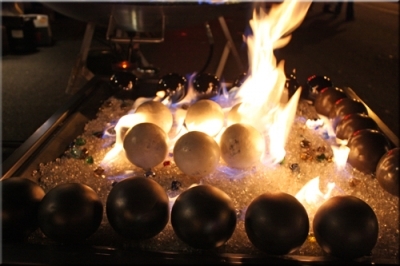 There is nothing wrong with the FireBalls just because they look different than any other previous balls manufactured or purchased.